Red Poll steers have demonstrated an ability to suit a range of markets. They can be sold straight off their mothers as vealers, or alternatively they can be grass fed or lot fed to suit the domestic supermarket trade. 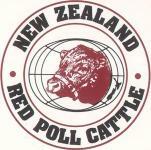 The ability of Red Poll steers to suit a number of markets is well established. Compared to other breeds, only a small number of Red Poll steers are entered in carcass competitions each year. However, their results are consistently good with high scoring and winning carcass far exceeding their numerical strength. The dominant natural poll and uniform red colour, combined with excellent beef qualities makes the Red Poll bull the ideal animal for any cross breeding programme. The Red bull transmit most of the highly sought after maternal qualities to their progeny, which makes Red Poll - cross cows excellent base cows for stud and commercial breeding programmes. Red Poll cattle, being of medium frame, produce small calves with rapid growth which make the Red Poll bull ideal for open heifers. The Red Poll bull is also noted for their excellent work rate, even under the harshest climatic and natural conditions. Red Poll bulls have been widely used in Australian beef herds to improve milk production in crossbred females and to introduce the normally dominant poll gene. They are still being used for this purpose today. In many areas three-way crosses are made by mating herds of Red Poll/Hereford and Red Poll/Shorthorn females with Angus or Limousin bulls to produce top quality vealer calves for the domestic market. Red Poll females can also form the basis of a simple 2-way cross when mated to Limousin, Simmental or Charolais bulls to produce heavy vealers or supermarket steers. In northern NSW and southern Queensland Red Poll bulls can help breeders target specific market segments when mated to a European-British breed cross. For example mating a Red Poll bull to Simmental/Hereford cross cows to help keep the maturity of the calves in the early-medium range, and in the heavy vealer category. In Queensland Red Polls are used in upgrading programs of Bos Indicus breeds to introduce the poll gene, add "softness", improve fertility and milking ability and to "tidy up" loose sheaths and briskets. 80 % to 95 % reds when crossed with other breeds and will produce a uniform herd of cattle from any mixed lot of cows. Pigmentation virtually eliminates eye cancer when crossed with the white faced breeds. Quality steers with tender well trimmed and muscled carcasses (ideal for the modern consumer). Through careful genetic improvement Red Polls have become recognised as producers of excellent beef both as pure bred and cross-bred. Red Polls and Red Poll cross animals can be marketed straight from their mothers. The carcass is trim and well muscled without excessive fat. Because they do not lay down excessive fat, Red Polls often dress heavier than they appear.